The Predator wetsuit is perfect for the swimmer looking for the ultimate swim assistance - now with extended 0.88Free technology for the ultimate feeling of freedom and an even higher level of buoyancy to keep you streamlined even when you tire. 0.88 FREE TECHNOLOGY At just 0.88mm thick, the 0.88 Free Material used on the sleeves, underarms and now upper back of the Predator make it feel like you're not even wearing a wetsuit - with total freedom throughout every phase of your stroke. EXOLIFT WITH AERODOME The unique sandwiching of Exo-Lift technology and the super buoyant Aerodome neoprene on the lower front and back of the suit provides the ultimate lift where it's most needed. These panels have no lining and so don't absorb water and so the level of buoyancy offered remains unchanged no matter how long you've been in the water. CORE LATERAL STABILIZER (CLS)Using a less flexible material on the core panels to stabilize the body. The suit feels stiff but once in the water it gives the feeling of swimming on a surfboard - greatly improving your body position and so also your speed. Please note: This is an ex-demo wetsuit. In a great condition, however, there are some slight marks as it has been tried on. 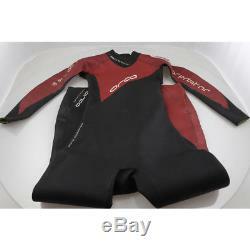 This wetsuit is recommended for people that are 5ft10 to 6ft1 or 170cm to 185cm and 94cm to 99cm chest size. 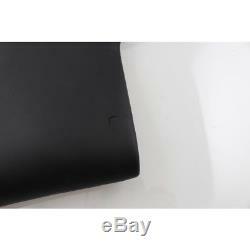 YAMAMOTO - The Yamamoto Corporation is the worlds main supplier of high performance neoprene. Its seal represents quality, technology and innovation. 0.88 FREE - 0.88 Free is a revolutionary material developed by Orca. The five layer construction combined with a patented heat reflective Titanium coating is the secret behind the extraordinarily high insulation effect in such a lightweight material. This results in extreme stretch and flexibility, high buoyancy and insulation as well as low drag in the water. 0.88 Free really is the ultimate weapon for speed in the water. CLS - The Core Lateral Stabilizer (CLS) system is a revolutionary new feature that provides body alignment assistance. The effect of 5mm Exo-Cell side panels alongside the 4mm Exo-Lift front panel is that of a floation device - stabilizing the core by preventing lateral movement without restricting rolling. The result is an effortlessly streamlined body position, allowing less fatigue and so a faster time in the water. 44 CELL - Yamamoto Corporation is regarded as the worlds top producer of neoprene for triathlon wetsuits in the world, and its 44cell neoprene is the pinnacle for flexibility, suppleness, fit and comfort. Orca uses 1.5mm panels of Yamamoto 44cell neoprene in the key underarm area of the Predator to compliment the super stretchy 0.88 Free arms-providing you with a wetsuit swimming experience never felt before. HYDROLITE - HydroLite panels make transition that extra bit faster using the super fast SCS (Nano ICE in the Predator) which combined with a special lining which absorbs less water to improve buoyancy while also being extremely sleek -making the suit fast to remove in transition saving you precious second. NANO ICE - Super Composite Skin (SCS) has become the benchmark for coating the smoothskin neoprene used in triathlon wetsuits, to reduce friction and increase speed through the water. Orca uses Yamamoto Corporations latest Nano SCS for an even lower drag co-efficient, ensuring the fastest swim possible. The underwater co-efficient of dynamic friction of the Nano SCS is 0.026 in comparison to 4.0 of regular neoprene. Less friction = more speed! 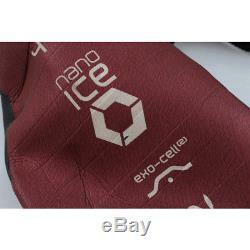 Nano ICE is the latest upgrade to Nano SCS. INFINITY SKIN - Its whats on the inside that counts and Orcas unique InfinitySkin lining plays an integral part in the unbelievable flexibility of our top end wetsuits. Constructed from a high stretch nylon, InfinitySkin is strategically placed where ultimate stretch is required and allows the wetsuit to move dynamically through your swim stroke. AERODOME 2 - Beneath the dimpled surface of Orcas Aerodome 39-cell neoprene are hundreds of air cavities, which provide 30% more buoyancy than normal 5mm neoprene. Aerodome panels are strategically placed around the heaviest parts of the body, lifting you into the optimum swimming position. Aerodome 2 is an upgrade that uses a new lining to increase flexibility and comfort. There is a mark on the left sleeve. There is a mark on the rear of the wetsuit at the top of the zipper. There is a small section of the wetsuit at the base of the zipper that appears to have been taken out. There is a nail mark on the back of the left thigh which has not gone through. There is a slight mark on the left knee. 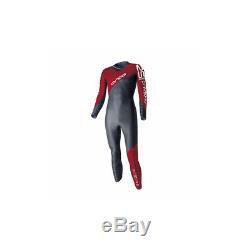 The item "Orca RS1 Predator Womens Large Ex-Demo slight marks Triathlon Wetsuit Black" is in sale since Monday, July 16, 2018. 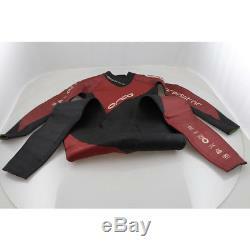 This item is in the category "Sporting Goods\SCUBA & Snorkelling\Wetsuits\Other Wetsuits". 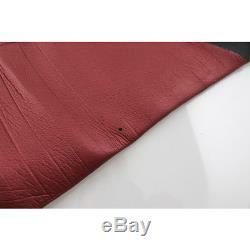 The seller is "sigmasportuk" and is located in United Kingdom. This item can be shipped worldwide.